ROLLING MEADOWS, Ill.--(BUSINESS WIRE)--Only half (53 percent) of surveyed business technology professionals believe their organization’s leadership is digitally literate, according to ISACA’s new Digital Transformation Barometer research. The other 47 percent either don’t think their business leaders have a solid understanding of technology and its impacts, or are unsure. 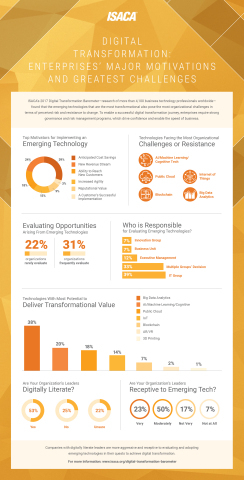 In addition, the global research study tempers the hype surrounding some emerging technologies, as respondents reality checked which technologies will be rapidly adopted, cautiously tested or parked for future consideration in the digital transformation crusade. The findings were released today and paint a concerning portrait for the progress to date, and future of digital transformation across the globe. The Digital Transformation Barometer data delves into digital transformation and digital literacy within leadership, as well as emerging and disruptive technologies within several industries. The full research report and additional resources can be found here. A concerning 47 percent aren’t confident that their leaders are digitally literate, the data indicates. With nearly a quarter of these same leaders noted as needing a stronger understanding of technology’s benefits and risks, digital literacy of global organizations’ leadership across the industry and geographical spectrum is in question. Despite the sense of urgency to embrace digital transformation across the board, less than a quarter of organizations said they believe their senior leadership is very receptive to adopting emerging technologies. Half of leadership teams are considered moderately receptive and one in five (20 percent) are not receptive. Furthermore, challenges with digital literacy and receptivity to adopting emerging technology are not limited to the C-suite. Broader organizational challenges and cultural resistance play a role in the process of deploying certain digital transformation technologies. Almost half of global respondents anticipate facing organizational challenges or resistance when deploying AI/machine learning/cognitive tech (49 percent), public cloud (48 percent), and Internet of Things (46 percent). Roughly a third of respondents anticipate the same kind of resistance when deploying blockchain (34 percent) or big data analytics (31 percent). Big data analytics ranked highest in the chance of delivering transformational value to organizations (38 percent), easily besting AI/machine learning/cognitive (20 percent), public cloud (18 percent), IoT (14 percent), blockchain (7 percent), and AR/VR (2 percent). Big data analytics was also the leader in intended deployment plans for the coming year. At this point, respondents believe AR/VR appears as more of a wishlist item rather than reality as most organizations are not deploying the technology yet. Perhaps because of the few, but very public, data breaches in the news that came from IoT devices, the resistance to IoT adoption is high in sectors most affected, including healthcare (71 percent) and government/military (69 percent). Seventy-four percent of surveyed business technology leaders are moderately to extremely concerned about their organization’s ability to safeguard connected devices in IoT. The ISACA Digital Transformation Barometer research, conducted in the second quarter of 2017, surveyed 4,164 information technology professionals worldwide. Results are at www.isaca.org/digital-transformation-barometer.